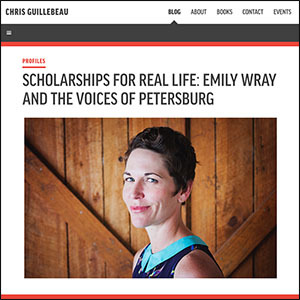 The Voices of Petersburg project was recently featured on Chris Guillebeau's blog, The Art of Non-Conformity. Check out the full article! Chris Guillebeau is a New York Times bestselling author and modern-day explorer. His first book, The Art of Non-Conformity, was translated into more than twenty languages. His second book, The $100 Startup, was a New York Times and Wall Street Journal bestseller, selling more than 300,000 copies worldwide. His latest book, The Happiness of Pursuit, was published in September 2014 and was also a New York Times bestseller.